We offer cleaning wipes in premoistened or dry clothes. Premoistened wipes are available with a blend of pure, reagent-grade 70% isopropyl alcohol and 30% reagent-grade deionized water, or 100% pure reagent-grade deionized water. Dry clothes can be used with any liquid. 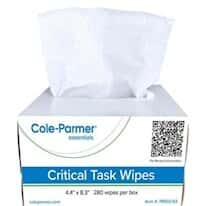 If your application requires cleaning wipes with 510K FDA clearance for medical equipment and instruments, we have them!